I guess this is a good problem to have, but a couple of people have now asked "Where can I see some of your photos?". I don't think it would be too great to send a Dropbox link, but I have been emailing photos, which can also be a little unwieldy. I've looked around a little bit, and it seems like you can obtain a website from just about anywhere. Any suggestions for getting going, and setting up something reasonable simple as a place to direct people to see some of my photos? The domain name I want is available, and that's probably the place to start. But as far as setting one up, I'm sure there are plenty of palces to go. I had some business cards made up through "Vistaprint" that I really like, and they also advertise website services. Just one of the thousands that do. Any opinions or suggestions would be appreciated. Client response galleries (I use this to allow clients to choose their images for their album). Galleries with carts linked to PayPal allowing clients to view and or buy images direct from my website. This just makes life a little easier for me and my clients. You can always set up a Flickr Page until you get a website up and running. I love my Squarespace! I use the squarespace as my portfolio but still use smugmug for the ability that people to order prints or pay for downloads. I don't find many people are even ordering prints anymore( folks just LOVE Screenshots), but I need smugmug as one of my backups and it is where I store my family albums that can be viewed by my family with a password. If i have a non portrait session, like a sports event, I have no problem directing people to my smugmug site and viewing the large watermarked images. I do not need to meet with those people in person to discuss the image, its pretty much " if you like the image then purchase it and if not, it won't be around for ever. The one negative about Squarespace is that it does not work directly with Lightroom, which is a bummer and an added step. It's cheap and your photos will probably look really nice on any one of their many templates. It has its downsides. You can't call them. So customer service is slow. Customer service used to be terrible but I think it's gotten better. The templates love photos -- they do not love text. They are also not very flexible -- which is good for if you need a 'paint by the numbers' system as I do and if you want to control your content rather than have to ask someone else to do it every time you want to change your site. But if you are computer/code/website design literate you probably want more flexibility. Also, some of these other services are probably better (Smugmug and Zenfolio) if you want your clients to be able to order pix off your site and/or download them and/or view them in a private client viewing section. I think Bludomain has those features but not sure how sophisticated they are. Years ago I had a Bludomain client viewing section and it was terrible. Beyond terrible. But that was a long time ago. Anyway, they are super cheap now so worth a look. For client viewing now I use Proofcast.com. Not a website. Just viewing and ordering of their photos. Thanks, Skip. I needed something quickly so someone here at my work who was looking for a photographer, so I took SalPhoto's advice and set up a Flickr page. I was able to easily add and update when she wanted to see some of my outdoor work. I think I may get hired. I still want a "real" website, so I will look into Bludomain. I use Namecheap.com for my website. The basic shared hosting is cheap. Cheaper still is www.wordpress.com where you can set up your own website / blog but I think I'm right in saying that you are restricted to which themes you can use to design your website. But its a good place to start your Wordpress experience. I host 4 websites with Namecheap. They give a good service in my opinion and it's been easy to upgrade my hosting package. As I mentioned above there is a control panel - cpanel with the basic shared hosting. This includes Softaculous in the Software/Services section which will automatically install Wordpress for you. It will also automatically upgrade it each time and will automatically backup your website. I've used several website templates and I'm currently using Photocrati where you get a variety of themes to choose from. My website: johnspixs.com. They also own the nextgen-gallery plugin for Wordpress for anyone wanting to post wedding picture galleries and password protect them. They will rebill you membership at the end of the 12 months unless you get them to cancel it. You don't get updates, etc. when you do this. But they seem nice people and answered my questions very quickly. Thanks for that info, question: I went to the Namecheap.com site, chose a domain name, and added a couple of things, now my question before I order and done, you get to build your website through them? It's not purely a domain name/hosting thing is it? Also what is 'WhoIsGuard' option I chose, what does it do and do I need it. 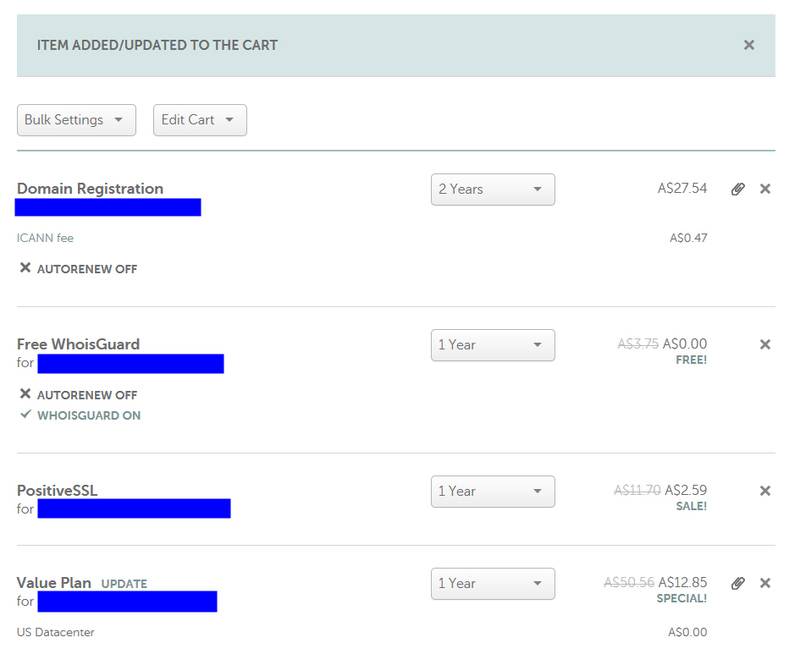 Check the screenshot I have ordered, anything else I should add? Oh, there is also when first ordering an option *not* to have it 'Auto Renew' just to let you know. Anything else I need/or to know, appreciated. I wanted to build a new site, and this looks great as far as pricing, etc. The pricing is good and its reliable. I've had no problems. The Free WHois Guard changes your personal details. When someone searches for your IP address of your website they will get no inofrmation about you. I thought they were discontinuing this service. I don't think they build the website for you. Remember the website will have to propogate which means it could be 24 hours before you see it online. Look around for helpful videos at Namecheap. How much do you know about hosting, etc.? If you are a newbie, go to wordpress.com and open an account and a wordpress website for FREE. Then you can play around with it uploading pictures, etc. It's a learning by doing process. You will receive an e-mail from Namecheap with all your details including how to access your control panel or cpanel. You visit your cpanel and scroll down to Softaculous in the Software/Services. Click on the button. Then you will be offered a lot of different programmes to install on your new website. Click on the Wordpress button and follow the instructions. It might want to install Wordpress in a sub directory like "wp". Don't do that. Leave it blank. If you make a mistake: delete the installation and start again! You will also have to make a user name and password. This is to enter your Wordpress website's administrative panel. You will now have a wordpress website fully operational with the standard theme. You can change the themes and I'm working with Photocrati at the moment. Forgot to mention that you use the cpanel to set up your e-mail account. Thanks a lot John, helpful info, very appreciated.